The 'Animate' and 'Preview' model sets are included with the demo version. All others require 'Core' or 'Pro' versions to work. To install downloaded sets, unzip (using the 7-zip utility) into the 'FaceGen/Model Sets/' subdirectory of your user documents directory. Face cutout optimized for fast updates and fluid editing. No expressions or accessories. Overlay the original MakeHuman mouth and teeth textures on the exported texture image, if desired. 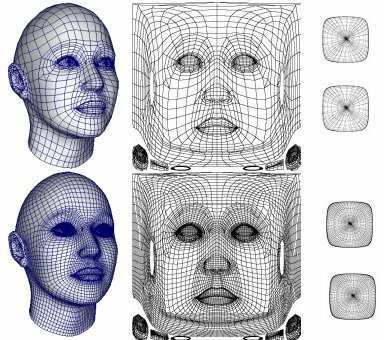 FrameForge v3.5a Actors compatible mesh with a variety of hairstyles. Fuse no longer supports customization. The instructions below only work with the legacy Fuse 1.3 version. In the 'Mesh Information' dialog, select 'Customize Type' 'FemaleFitA' or 'MaleFitA' to match the mesh you selected in Modeller above. Hit 'Next'. Use your character within Fuse with their auto-generated albedo maps, then when you export from fuse you can apply the albedo map you exported from FaceGen. Head meshes with Visage compatible animation target names. A head mesh divided into front and back halves with different texture maps, a full set of animation morphs, and a torso. Optimized for real-time modification with the FaceGen SDK. The head mesh from the older Modeller 3.5. Teeth, tongue and sock are separate meshes and share a color map, and the left and right eye surfaces are separate meshes and share a color map. To use with newer versions of Modeller you must follow the 'Migrating Model Sets' instructions here. A high and medium resolution head model with separate eye models, both quite dense. A single texture map for the head (except the eyes) with inner lips and eyeliner areas mapped separately, UV layout exaggerating the face area. Hemispherical eyes (or somewhat hemispherical depending on the face shape) for easier eye motion. Includes 31 animation morphs.